With the end of the IPv4 blocks, one would think that the adoption of IPv6 is near. In reality it is not so, and it is really far from that situation. IPv4 to IPv6 is not giving its way lovingly. Adoption of IPv6 is opt out of opt out situation. The IPv4 are about to end in number, but many companies in order to keep the old scheme, are willing to pay large numbers to win the old IP. Despite the new services introduced with the new Internet Protocol, despite the simplification in the management of IP networks, it seems that many users are still looking for the old IPv4, fueling a real resale market. There are practical points which we have highlighted in this article with the title IPv4 to IPv6 – Adoption and Abandonment. Based on a pure mathematical reasoning, one could argue that IPv6 is the natural evolution of the IPv4 and which soon will grow like wildfire. Availability of IPv6 addresses only virtually unlimited. Yet we are not recording a great use of this new Internet Protocol. According to the latest statistics of the Internet by Akamai, the first nation to promote and use IPv6 addresses is Belgium, followed by other European countries, Germany and the United States of America. Much of this growth does not come from traditional Internet service providers. For example Verizon was the first to recognize that IPv6 addresses were a necessity and not an option. In 2014 more than half of Verizon Wireless customers were using IPv6 and almost 30% of T-mobile users was on IPv6. But in the world, the traditional does not follow the same trend, especially when it comes to governments or financial sectors. But if the IPv6 are not currently used and IPv4 are up, what is going to happen? Simple, many users are buying old IPv4 addresses, fueling a thriving resale market. According to Doug madory, director of analysis Dyn Research, the market for IPv4 addresses began when the first company Addrex opened the door to this world, by providing a real marketplace of IP addresses. Currently, there are over two dozen online services that offer this type of resale. IPv4 addresses for sale come from a variety of sources. In the European and Middle East most come from Romania. The cost of a single address is $10. Although it may seem a minimum, we must consider that there are many companies who intend to spend considerable sums just to win IPv4 addresses, one can spent more than $15 million to buy in bulk. The companies, appear determined to spend good money just to be able to keep the old scheme of IPv4 addresses. Romania has shown to be behind the flourishing business, probably in the future other companies will move towards this market to earn some easy money. But we must keep in mind that the increasing use of Intenet and especially mobile devices, will lead to the forced decline of IPv4 addresses. Within a decade, in fact, they will probably not be the most available addresses, not even paying the stratospheric figures. Around the year 2025, IPv4 possibly will be “old”. There is also money behind IPv6. It is practically mandatory to hold both the IPv4 and IPv6 at present for the web servers. The operational support of IPv6 seems limp and although there are many networks and devices ready to switch and manage dual-stack, in reality it continues to ignore the existence of the new protocol and many companies sat to wait for the evolution of the events, rather than become an active part. In fact, if one realizes it or no – the IPv6 is already running on a variety of networks and is not in any way run, as it lacks the implementation at different levels of a training plan. We yet have no guide on servers where the readers will need to do SSH using IPv6. Simply, why we’ll want IPv4 to die when there is no actually advantage incurs to us? All guides in this world is written for IPv6 if the step to SSH, connecting FTP is mentioned. 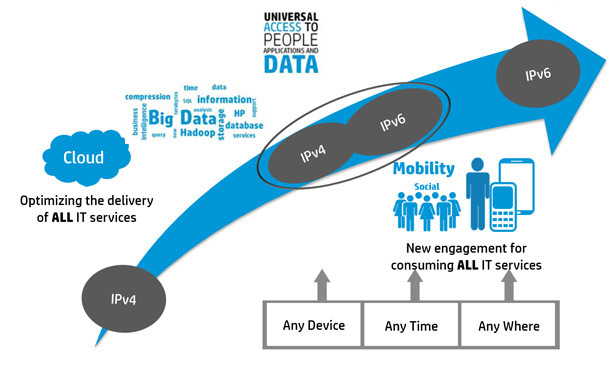 We, from a practical idea know it very well – HP Cloud will be keeping good number of IPv4 for the next 5 years. In fact, there is no use of IPv6 in HP Cloud for the websites. The charge will go higher if HP Cloud adds the IPv6 option. IPv6 is not exactly related to security. As corporate consumer, we would rather love to give HP the priority to decide what to use – IPv4 or IPv6. We can not exactly calculate what new unknown risks will be added for sole dependency on a new standard. None uses IPv6 alone at present. In practice, the from the statistics it is clear that, Verizon has doubled the usage of IPv6 in less than a year and currently stands at 54 percent of usage, while Time Warner Cable has a quantifiable IPv6 traffic at around 10 percent. These data are around the consumer grade usage related to ISP. On average, a customer’s Web hosting is not convinced to move to a new technology if the same is not adopted by 95 percent of the market. This might be true for the transition from IPv4 to IPv6 and the new protocol until it reaches the market share equal to or greater than 95 percent, it is difficult for customers willingly accept a forced passage from one to another type of infrastructure. They can actually charge us whatever they want just because there are SEO link juice value, chance of getting traffic out of the current IPv4 holding. Frankly a decade is too big time to predict anything. After 5 years, the way we do DNS resolution might change; we will probably not need any IP after a decade. For web hosting purpose, none wants to go in that IP fuss again. This Article Has Been Shared 5601 Times! Here is a basic article demystifying IPv4 and IPv6 details. IPv4 is the first version of the Protocol and is the technical basis of the Internet. gzip : What is gzip We Use in .htaccess ? gzip is a compression program, which, along with the appropriate file format gzip is available virtually in all computer OS. gzip is short name of GNU Zip. Cite this article as: Abhishek Ghosh, "IPv4 to IPv6 : Adoption and Abandonment," in The Customize Windows, May 4, 2015, April 21, 2019, https://thecustomizewindows.com/2015/05/ipv4-to-ipv6-adoption-and-abandonment/.